An Australian soldier native from New South Wales, billeted 6 weeks in Vignacourt, specified in a letter of 1918, the starvation of the local population. ".....it is a heart breaking to see the civil population. They have had a very trying time for past four years, and you can see the starvation on the face.....". The restrictions and rationing of the food began, the first year of the war. Rutabagas (specific turnips), topinambours (Jerusalem articokes) are vegetables linked to the second world war for French civilians who lived during those times. The vegetables of substitutions made a shy reappearance since for years on markets stalls and in the kitchen of the young chefs. Soldiers also known the feed rations. The hot meals were not usual and the foodstuffs did not arrive fresh in the trenches. The condition of the vegetables was described, likewise by the French soldiers. Soldiers ate almost every day, but with more or less varied food : potatoes, beans, bread and canned meat, sometimes soup when it was possible to bake it. For the army cook, to change from the ordinary, the difficulty was to supply for the whole of unit in large quantity, sometimes risking their lives. The food was buy close to unit stationned or to several kilometers away and could be transported by rail or car, after negiotiating the price in situ. 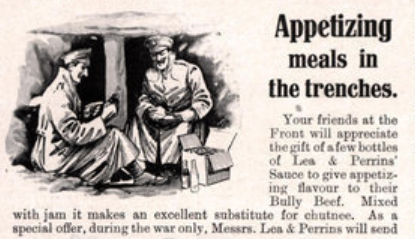 The soldiers sometimes, receive parcels sent by their relatives, with food (for example: peas, tomatoes). This was the case of the British soldier Charles Justin Willis. He was seriously injured a few days later. To rediscover the soldier' food during war, I added below the trench stew recipe. 5 minutes for the preparation, 10 mn for the cooking. - Add the biscuits and stir (optional). The source of this recipe is the website cookit, Courtesy of Heather Cree, for East of England Brodband Network. The Xmas menu for Battalion A.I.F. below gives up ideas of what ingredients we can found at this time, specially during Xmas. Courtesy of Sally BERTRAM - CHARLES Robert Edward was cooker, see "Passing soldiers" section. Purée is mash in fact, for this case it was certainly thick soups. Mulligatawny is a soup of Anglo-Indian origin with spices like as pepper and curry. There are many variations according ingredients available. This is, normally, hearty soup added of vegetables and or, rice, and or, meat. "Cuite au four": cooked in the oven in fact this is a roast beef. Jus de Sunray: Meat juice, ray of sunshine, this is the sauce of roasted meat. Turks-cap: illustrious strangers in our ranks :) . Probably culinary herb - IMHO. Pudding-aux-prunes: Plum pudding. (There are plum trees in the Vignacourt gardens. The plum tart is a traditionnal dish in Nothern France). The famous Blanc manger :) is old french classic. A forgotten recipe by French people, reworked recently by top chefs, accompanied in this menu by the jam, red color certainly, "with gellee". Restaurant Godbert called "Salons Godbert" (Godbert lounge) was a renowned restaurant in Amiens city. Very important personnalities came here (Mayor, Marshal Foch, President, Prince, Singer) but it was also known by officers. Picardy or French classics were served for examples: Picardy crepes "Ficelles Picardes" filled with mushrooms duxelles, Duck Paté, Fillet de Sole, Chikens of Bresse, Liquor soufflé. Land Market-gardening of Amiens called "Hortillonnages", near the Somme river, not far from the restaurant, allowed to supply good vegetables. Women took over the culture of these gardens during the war, when it was possible. The tea used for enhanced the water taste was included in the ration of the allied soldiers, coffee and a little wine for the local soldiers. The alcohol of mint "Ricqlès" (name of dutch origin) was part of the package of the french soldiers, it served of antiseptic, allowed to clean the water and to fight against the digestive disorders. Several flasks were found during the exhumation of soldiers' bodies in Verdun. Beers and alcohol were also supplied in the battalions' stocks. The evening, coffee shops were frequented by soldiers to Vignacourt. Even today we can still see in a few Picardy homes this traditionnal rum jar. S.R.D. for Service Rhum dilluted. It was a manufacturing of Pearson & Co The Potteries, Whittington Moo, Chesterfield, UK.